Davies bravely battled his way into fourth place in first race despite a difficult start to the weekend. 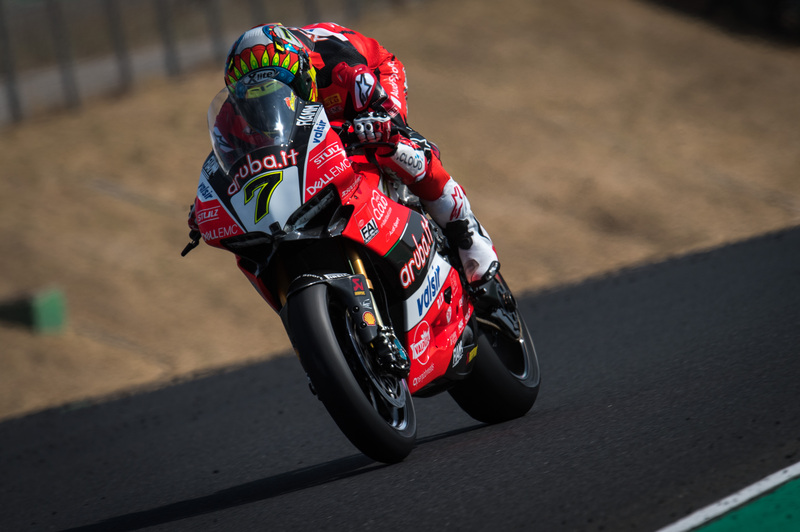 Chaz Davies admitted he exceeded expectations after bagging fourth place on his World Superbikes return in Portugal. The Knighton-born rider is still recovering having bust his right shoulder twice during the summer break which had put his participation in doubt. But despite starting from the fifth row of the grid in 14th spot, Davies bravely battled his way up to finish fourth in the opening race of the weekend. And that will give him a start on pole position for Sunday’s second race on the track. The Aruba it Racing Ducati rider said: “It’s been a tough weekend and a tough summer so I’m really happy. I wasn’t expecting that. “I had a great start, then it came up on me a little bit. There was a bit of pushing in turn 1, so I stayed cautious and held the inside line, which paid off. “The first corners were crucial, as I came out in sixth place. “I was trying to hang with VD Mark and recover from the front, but we struggled with turning a little bit. “Also, in the last five laps I took it a little bit easier physically, knowing that I could just hold position. “Overall I’m really, really happy. The feeling on the bike keeps getting better after each session. Davies’ participation had been in doubt after busting his shoulder twice during the summer. Davies had forgotten that finishing fourth meant he would start on pole under the regulations introduced last season to try and spice up the racing. “My wife reminded me,” added the 31-year-old. “It’s an added bonus. Davies is now 104 points behind Kawasaki’s reigning champion Jonathan Rea who romped to a fifth win on the trot and 11th of the season. Marco Melandri was second on the other aruba it Racing bike with Michael van der Mark third. That allowed the Dutchman to slightly close the gap on Davies in the battle for second in the championship with the difference now being 27 points with 175 points left to race for. Marco Zambenedetti, Technical Coordinator on track for Ducati Corse, said: “Chaz gifted us with a memorable comeback despite not being in his best shape physically.